The NEC E171M-BK is a 17" desktop monitor designed to enhance your productivity. This monitor has 1280 x 1024 HD resolution and intelligent power manager system. It features ECO Mode that adjust brightness and LED baclklight technology that allows a slimmer profile, increased power savings and lighter weight. 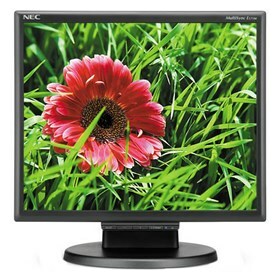 The E171M-BK desktop display monitor features 170° viewing angle along with 250 cd/m2 brightness. With HDMI, DVI-D, VGA and a port USB 3.0 hub connectors you get expanded connectivity with advanced technology. Additionally this monitor includes carbon footprint meter, integrated speakers and headphone jack. The NEC E171M-BK has many exciting features for users of all types. See the NEC E171M-BK gallery images above for more product views. The NEC E171M-BK is sold as a Brand New Unopened Item.